In Yucatan, Mayans still dig pits in their yards to roast whole pigs or chickens to sell along the roadside for a spicy, smoky Sunday breakfast treat. 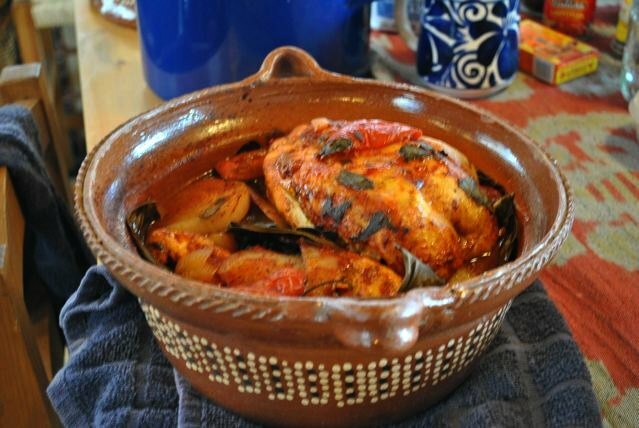 However, this is something we can easily create at home after a foray into a good Hispanic or Oriental market for a couple of basic ingredients–namely achiote paste made from rock-hard brick red annatto seeds ground with spices, and fresh banana leaves. If you’re lucky enough to find (or grow) fresh epazote, be sure to pick up a bunch of that, too. Back at the ranch, prepare the marinade for your pibil by tossing into your trusty blender 4 tablespoons of achiote paste with 1/2 c. fresh orange juice and 1/4 c. fresh lime juice, plus a splash of white vinegar for good measure. Add a clove or two of fresh garlic, about a half dozen whole allspice berries and 1 tsp. sea salt and whiz away to create your beautiful brick red marinade. Pour this fragrant sauce over about 4 lbs. of bone-in, skin-on chicken breasts or boneless pork leg, deeply scored, and allow the meat to marinate for several hours or overnight. Get a good roasting pan with a lid, preferably pottery or stoneware, and line it with the fresh banana leaves. Place the marinated meat lovingly in your substitute pit, pouring extra sauce over the meat. 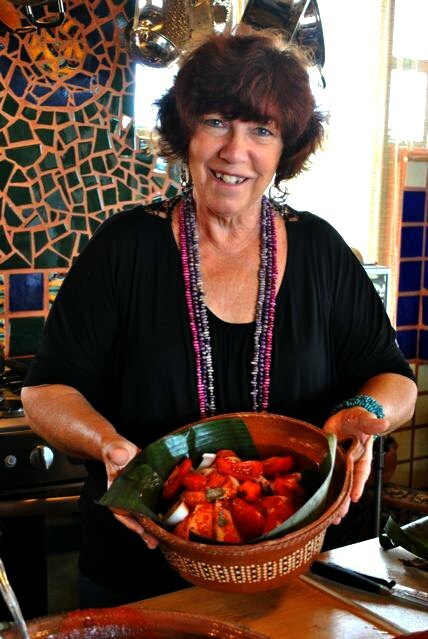 Slice up an entire large white onion and three or four red ripe Roma tomatoes onto the meat, adding a large sprig of fresh epazote (dried will do in a pinch), and tuck in two or three fresh, bright orange habanero chiles. Don’t worry–if you don’t open them they won’t add too much heat! Cover your pibil with fresh banana leaves, tuck it in nicely and cover tightly. Bake it for an hour or so in a 350 oven until the meat is tender, then remove it from the oven, shred the meat into the juice and remove the banana leaves. 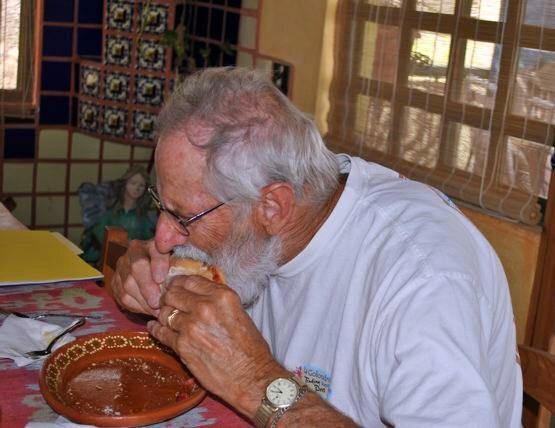 Correct the seasoning–I usually wind up mashing and adding the habaneros to bring up the spice level–and put the whole shebang on a burner and continue cooking until the meat is very tender and most of the sauce has been absorbed… Torta time!! Ah, but I digress… you will of course have prepared a jar of southern Mexico’s famous day-glo pink pickled onions, ubiquitous throughout the south on every table. Simply slice a dark red onion in half, then slice as thin or thick as you like. Pour boiling water over it briefly to wilt and cut the heat, then pack in a glass jar, adding white vinegar to fill the jar halfway, plus a teaspoon of sea salt. Tuck a flame-blackened habanero in the jar, and turn it over every time you open the fridge for a day and voila! Day-glo pink pickled onions for your tacos or tortas! If you have access to a Mexican bakery you’ll need a good telera, a French style flat roll perfect for making this sandwich. Otherwise, get the best your area has available. Pile on the pibil, scatter with vinegary onions and dive in! PERFECT party food! I hope you make up a big pib-full and enjoy with your foodie friends this holiday season.